I am just a collie lover, not a breeder or handler. I love that majestic collie look, the regal stance, that beautiful expression. Please continue with your "vision", the dogs on this website are a testament to the beauty of the collie. Slightly partial to Beret. I think the American Rough Collie has also been growing away from that traditional look and some breeders here are also trying to go back. I sincerely hope so. My concern has been the eyes - i swear they have gotten a lot smaller. I have a beautiful little collie who is 13 months old. She is a dainty little princess. But is she ever built solid under all that coat!!! It amazes me when I brush her!! She exhibits so much of that "typical" collie. Agile, quick, strong, powerful and yet so dainty and gentle. I wish I could get a picture of her standing. She is a cross between the English (Wicani) and the American (Van M). Thank you Rowan, it is not always easy but 'the work't is essential. We are custodians of this breed and we owe to those that worked so hard to create this wonderful breed in the first place, and we owe it to the dogs themselves. Thank you Cominut, I hope my vision does not become cloudy and I hope my courage does not fail me, thanks to people such as yourself I can take strength from you all and continue to forge ahead. I enjoyed reading this post. As a breeder, you have to breed according to your vision and your aspirations, whether others understand them or not is another question. The breed clearly needs people with vision and courage. 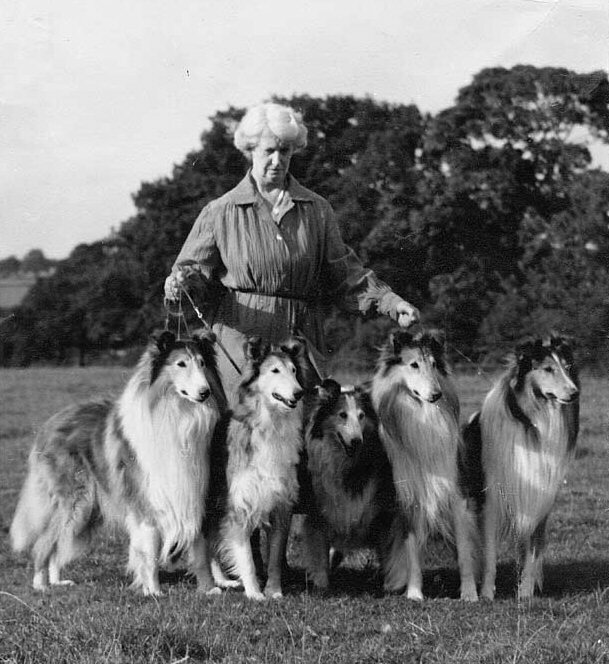 Very well put Angela, I know many are now striving to recreate the traditional Collie and I am sure common sense will prevail over fashion eventually. We must all keep ploughing forward regardless of the brick bats and rubbish that are thrown at us, I thank you from me and my collies that you have not given up in the face of the pressure that has been put on you. I know I am not alone, we have some good breeders working together here in the UK. However, I do not think that those breeders who claim we are not breeding to the UK breed standard are correct. The Collie has looked very similar in style since type was 'set' in the very early 1900's, only in recent years has it changed and mainly on British soil. Through my eyes...i am working to pull back 'Lassie' into our modern era, what others do is up to them. Thank you Cathy for your comment.